I thought it was you. Gee, it seems as if were only yesterday that you were in my remedial writing class for the terminally dim witted. It's sad to see that you are not only still a nit wit, lacking any creative insight, but from the sound of things, you remain unemployable. So sad you can't even scrape up $15. to buy items that are worth $50. I think you mean "it seems like it was just yesterday" I have no idea why you have used the subjunctive. Maybe you are stupid. 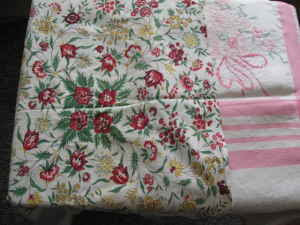 Are these "vINTAGE tABLE cLOTHES" vintage table-clothes or are they Vintage-table clothes? I have vintage table and I am looking for new clothes for it. If you find out, let me know. Table clothes?? What are they, pants, shirts, dresses, what? If only they were selling table cloths, I might be interested. Do you think table pants have 4 legs? If this is the person teaching the remedial writing class it's no wonder their country is so illiterate!